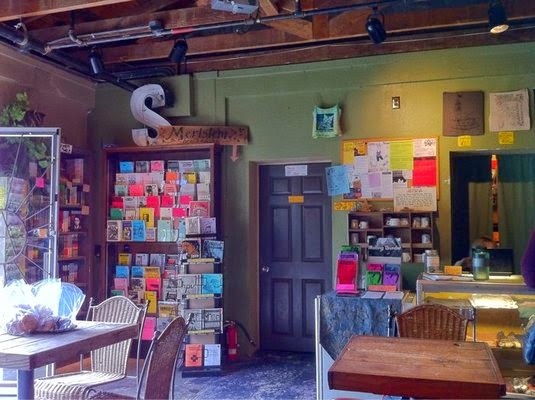 SubRosa - a community space: Spring/Summer2014 Fundraiser! Folks in the collective are in-and-out of town during the summer and our hours become (even more) erratic, This presents some financial difficulties for us. So, your donation will help us stay open during the lean times. It's part of our mission to provide a community space outside the realm of commerce. Your donations help SubRosa to continue to fulfill this mission, as we have for the last 5 and a half years. SubRosa also aims to be a vibrant social space. Not only do we have our regular open hours, but the space also hosts many different types of events such as, shows with local and out of town do-it-yourself bands, a variety of Free Skool Santa Cruz classes, Santa Cruz Guerilla Drive-In film screenings, an open mic, revolving art shows, and an eclectic array of other stuff...look through this website to see some of the history of past happenings. Your can donate to our secure page at EverRibbon, which collects the money through WePay. SubRosa is fiscally sponsored by a 501(c)(3) non-profit. 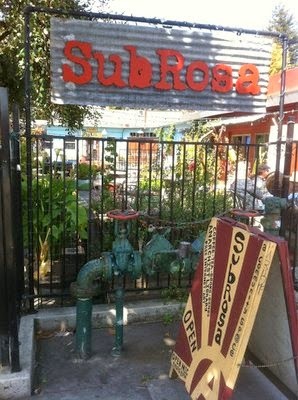 And so you can donate HERE and of course you can also come to SubRosa and make a contribution. We thank-you for any financial assistance you can offer no matter how large or small. And here is a facebook event-thingy that you can share with your actual friends and "friends."